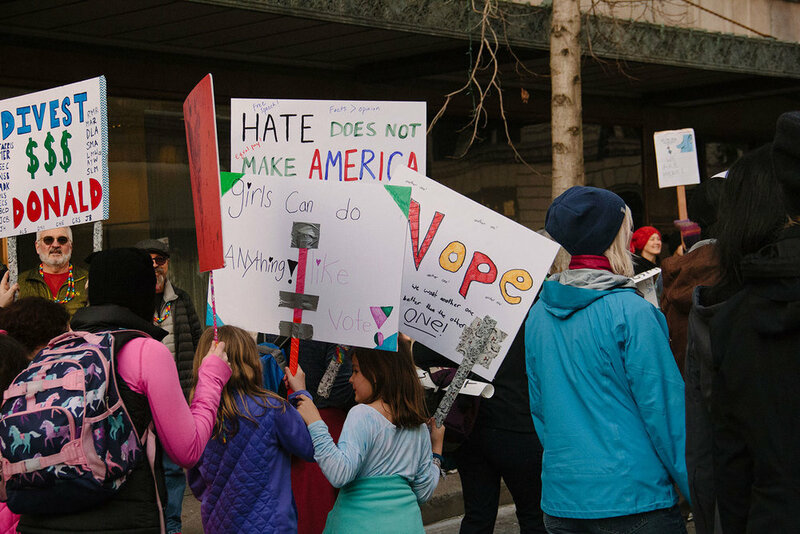 I am so glad I was able to take part in the Women's March this past weekend, and very inspired by the huge numbers of people who marched all across the globe! Seattle was estimated to have hit between 130-170k participants! I spent the night before the march cutting up construction paper to create my sign and was excited to show it off! But let me tell you, holding a sign in one hand and a camera in the other is not easy, and trying to snap photos of the crowd while walking was challenging. 'Event Photography' isn't really my cup of tea, but I gave it a shot (haha, shot, haha) and tried my best. I feel I was able to capture some of the energy that was bouncing off the huge crowds. Directly below is my co-worker Susie and me with my big blue sign. We marched with my boyfriend, his co-worker, and her husband. It was great seeing a lot of famiilar faces along the way! Did anyone else march? I'd love to hear about your experience. I know it's a day we won't ever forget!